Why should I upgrade to an SSD? 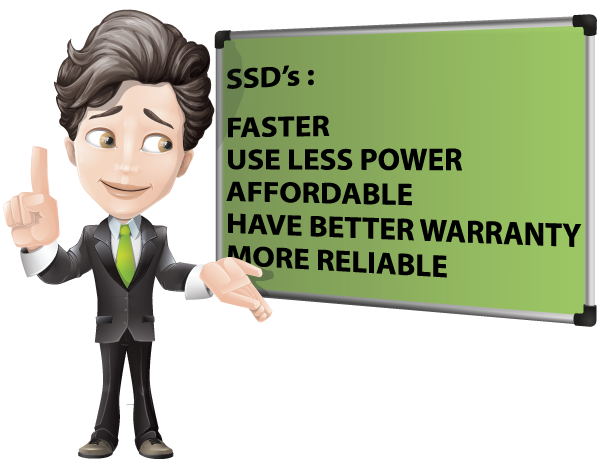 SSDs are flash memory based drives that offer much, much faster performance and superior reliability than traditional rotating hard drives. SSDs (solid state drives) are non-volatile which means they do not lose data when the power is turned off. SSDs on the market today are built to a globally accepted industry-standard, which means they are drop-in replacements for your traditional SATA connected hard drives. SSDs have zero moving parts, creating durability by eliminating the mechanical components and failures associated with traditional rotating type hard disk drives. The friction generated by all the moving parts in traditional hard drives creates heat, which is the leading cause in hard drive failure. In fact, hard drives are the #1 computer component most likely to fail. Because an SSD has zero moving parts, heat and noise are reduced or eliminated completely, resulting in a reliable solution compared to a traditional type hard drive. Ever have your laptop battery die during your favorite game? With no moving parts, SSDs require much less power, improving battery time considerably. Without all the moving parts that cause serious latency issues in common drives, SSDs are not impeded by rotational latency, spool-up, or seek time. This equates to faster boot times, faster loading of applications and greater overall system performance. With no moving parts, SSDs provide absolutely silent operation, kind of like a standard USB flash drive rather than the humming and clicking of a mechanical hard drive. Hard drives can produce high levels of failure-inducing heat due to all the moving parts necessary to operate it. In contrast, SSDs produce little-to-no heat because they have zero moving parts, thus keeping laptops, desktops and netbooks running much cooler. SSDs also have extreme shock and extreme vibration tolerances while their operating temperature range exceeds current standard hard drives.